In May/June 2017 I visited Indonesia on a private, customized tour, organized by Adventure Indonesia. The organization was great, everything worked like clockwork. I visited most of the major islands of Indonesia (Sumatra, Java, Sulawesi, Papua), plus some of the smaller islands in the Komodo National Park. I did not include Borneo, since I had visited the Malaysian part of Borneo before. Highlights of the trip were the Great Apes on Sumatra (Sumatran Orangutans (Pongo abelii, german: Sumatra-Orang-Utan, french: Orang-outan de Sumatra) and Sumatran White-handed Gibbon (Hylobates lar vestitus, german: Weißhandgibbon, french: Gibbon à mains blanches), old temples on Java, Stone-age caves on Sulawesi, indigenous people on Papua, and the Komodo Dragons (Varanus komodoensis, german: Komodowaran, french: Dragon de Komodo) in the Komodo National Park. After arriving in Medan on Sumatra, we drove to Tangkahan, a drive of about 7 hours. I stayed for one night at a lodge in Tangkahan. The next day I visited the Sumatran Elephants (Elephas maximus sumatranus, german: Sumatra-Elefant, french: Éléphant d'Asie). We washed and scrubbed the elephants, and then went for a 1-hour elephant ride. In the afternoon we hiked into the jungle for about two hours to a cave, where we stayed over night. The cave is actually behind a waterfall, it was quite scenic. The crew cooked dinner and breakfast at the cave, it was very good. It started raining shortly after we arrived at the cave, it just missed us on the hike. It was pretty warm (30-35°C (90-95°F)), with close to 100% humidity. There were lots of mosquitoes and lots of leeches in the jungle. On the way to the cave we walked through one of the rivers with hip-deep water. My clothes were pretty muddy, so I washed everything in the cave. But with 100% humidity behind the waterfall, nothing dried, so I was wearing wet clothes on the way back. In the cave the crew had set up a tent and air mattresses. Unfortunately, the air mattress leaked, so I ended up on the floor. In the evening I saw them pour a ring of salt around the tent. It was done to keep insects and other critters out of the tent. I had never seen that done before. The next morning we hiked back to Tangkahan and ended the hike by floating on inner tubes down the river. The hike and overnight stay in the cave was quite an adventure, I really enjoyed it. The next night was again at the lodge in Tangkahan. The next day we drove to Bukit Lawang, a 3.5-hour drive on dirt roads. I stayed in Bukit Lawang for two nights. The highlight in Bukit Lawang was the full day of Sumatran Orangutan (Pongo abelii, german: Sumatra-Orang-Utan, french: Orang-outan de Sumatra) tracking. We hiked for 7 hours through the jungle to find Orangutans and Gibbons. 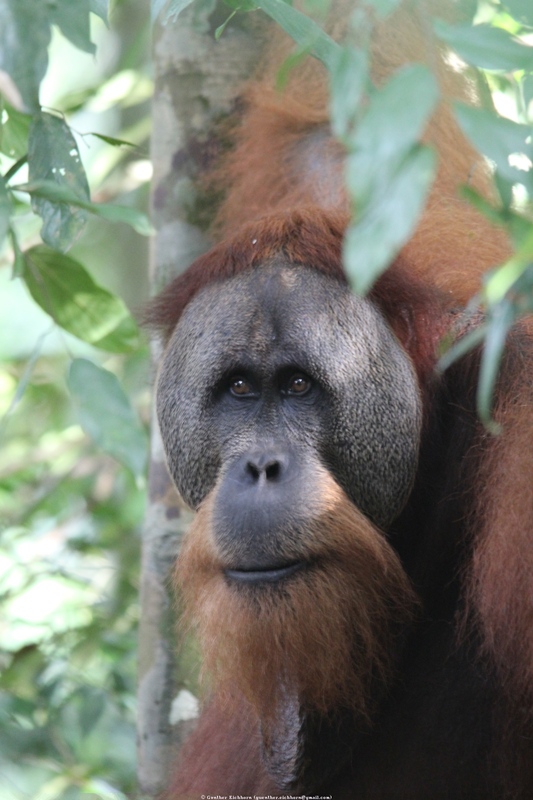 I saw six Orangutans (two mothers with babies, a single female, and a big male). The big male came down from the trees and was only about 5 m (16 ft) away. It was fantastic. From Bukit Lawang we drove to Berastagi, a 7-hour drive. I stayed in Berastagi for two nights. After the first night I hiked up the Sibayak Volcano. The steam vents on this volcano are impressive. After the hike I relaxed in the hot springs on the base of the volcano. From Berastagi we drove to Samosir Island, a 7-hour drive. Samosir Island is reached only by ferries, there are no bridges to the island. I stayed one night on Samosir Island. The next morning we visited old royal tombs, an open air museum of a local village, and watched a local dance performance, before driving back to Medan for a 1-night stay. From Medan I continued to the next island of the tour: Java. I flew to Yogyakarta on Java for a 3-night stay. On the first full day in Yogyakarta I visited the Borobudur Temple, a very impressive Buddhist temple complex. It is the largest Buddhist temple in Indonesia, dating from the 9th century. around the area are several smaller Buddhist temples that were also worth visiting. In the afternoon we drove up to the active Mount Merapi volcano. Unfortunately, it was cloudy, so I didn't get to see much of the volcano. This volcano erupts regularly every few years. In the evening I went to a dance performance. It was a great performance. The next day I went on a city tour of Yogyakarta with visits to the Keraton Ngayogyakarta Hadiningrat (Sultan Royal Palace) and the Taman Sari (Water Castle). After that I visited the Prambanan Temple complex, a large Hindu complex with temples dedicated to the Trimurti, the three main Hindu gods Brahma, Shiva, and Vishnu. This is the most beautiful Hindu monument in Indonesia. From Yogyakarta I took the train to Mojokerto, near Surabaya, a 4.5-hour train ride. From there we drove about three hours to Cemoro Lawang, near the volcano Mount Bromo, for a one night stay. The next day started early, at 4:00, to drive up to Mount Penanjakan to watch the sunrise. The sunrise watching was a zoo, there were hundreds of 4-WD cars and motorcycles on that mountain, and probably over a thousand people watching the sunrise. It took more than ½ hour to get our car out of the traffic jam. After watching the sunrise we drove to Mount Bromo. I rode on horseback to the volcano, the last part to the rim of the crater is on foot. The volcano is venting a lot of steam, it is quite loud. After the early morning excursion we drove to the Surabaya airport for my flight to Makassar on the next island: Sulawesi. I stayed in Makassar for one night. The next day we drove to Malino in the mountains south of Makassar, where I stayed for one night in a very nice lodge, Villa Tengah Sawah. It was a scenic drive, but some of the roads were pretty bad. Malino was built as a resort town by the Dutch in 1927. The area around Malino is quite nice, there is a nice waterfall near Malino, called Takapala. Unfortunately, it was raining most of the time I was in Malino, including when I visited the waterfall. Then it was back to Makassar for another night. The next day we drove to the Leang Leang Cave Complex. The cave Leang Pettakere has stone-age hand prints and paintings on their walls. They were inhabited from about 40,000 - 35,000 years ago. After the visit to the Leang Leang caves we visited the Ramang-Ramang village by boat, with some hiking around the village. From there we headed back to Makassar for an overnight flight to Jayapura on Papua. From Jayapura I flew to Wamena in the Baliem valley in central Papua. Wamena can be reached only by air, there are no roads going to Wamena. I stayed for three nights in Wamena. After the first night we hiked along the Baliem river for about six hours. On the hike we visited a local village. They were having a feast there in preparation for building a church. We were invited to share their meal. It was a very pleasant experience. The next day we went to the Obia village. The people there are from the Dani tribe and have preserved the old customs and clothes. My travel agency had arranged for a pig feast and dance. It was quite impressive. After the third night I flew back to Jayapura, where I stayed for a night. I visited Pulau Ase, an island in the Sentani Lake, and the Anthropology Museum in Jayapura. The fish market in Jayapura was also quite interesting. The next day I flew to Denpasar on Bali for a night. There were no excursions planned on Bali. The next day I continued on to Labuan Bajo on Flores Island for my visit to the Komodo National park. From the airport in Labuan Bajo I went directly to the harbor where a boat was waiting for me. I stayed on the boat for one night. On the first day on the boat I went snorkeling in a couple of places, including at the Pink Beach. The Pink Beach is colored by the remains of red corals that give it a pink hue. After a night on the boat we visited Komodo Island and Rinca Island. I saw Komodo Dragons (Varanus komodoensis, german: Komodowaran, french: Dragon de Komodo) on both Rinca and Komodo islands. They are impressive animals. The next night was spent in Labuan Bajo at the Bintang Flores Hotel. This was the nicest hotels I stayed in in Indonesia. The breakfast was excellent, and the staff was very friendly. The next morning I visited the Batu Cermin cave. The bats, cave crickets, and cave spiders were very interesting. This was the end of my visit to Indonesia. Indonesia has a population of over 260 million, it is the 4th most populous country. Half the population lives on Java, the world's most populous island. Indonesia comprises some 17,000 islands. The largest islands are Papua (2nd largest in the world, about half of the island is part of Indonesia), Borneo (3rd largest in the world, about ¾ of the island is part of Indonesia), Sumatra (6th largest in the world), Sulawesi, and Java. It is a very diverse country with some 300 ethnic groups and over 700 different local languages. The official language is Indonesian, which is a version of Malay. It was a Dutch colony and became independent in 1945. Indonesia is the world's most populous Muslim-majority country. 87% of the population is Muslim, 10% Christian, 1.6% Hindu, and 0.7% Buddhist. The Islam that is practiced in Indonesia is more liberal than in most other Muslim countries. It was supposed to be the dry season, but it rained basically every afternoon/evening. I guess climate change is affecting the general weather patterns. Palm oil is one of the important cash crops in Indonesia. A lot of forest has been cleared to make room for oil palm plantations. Other major crops are coconut, banana, and sugar cane. Other cash crops are coffee and rubber trees. On Papua, sago palms and sweet potatoes are important. I finally was able to taste Durian, infamous for its bad smell but good taste. To me it didn't smell bad at all. The durian is cracked open. Inside are several fruits (5 in the one I had), each in a thin soft membrane. The inside of each fruit is the color and consistency of vanilla cream or soft, creamy vanilla pudding. The taste also reminded me of vanilla. It was delicious. It is worth to try it. Everybody smokes. I don't think I have seen another country where such a large percentage of people is chain smoking. People are very friendly. What was most noticeable was the fact that a lot of people want to have a picture taken with me. It seems that being seen with European or American tourists is a prestige thing in Indonesia. Unfortunately, there was a lot of garbage along the roads, it is not a clean country. Traffic in the cities is heavy and fairly chaotic. There are LOTS of motorcycles on the roads. In the city, most riders wear helmets, outside the cities not so much. Food was mostly pretty good, simple but tasty. Portions are generally fairly small, much smaller than what I am used to in the USA. The main staple on Papua is sweet potatoes, they come with every meal. Beer was reasonably inexpensive in regular restaurants, quite expensive in the some of the hotels ($3-$7.50 for a 0.6 liter bottle). Because it was Ramadan, I couldn't get beer in several restaurants. Even in one of the hotels I couldn't get beer. In another hotel they had to serve the beer in a tea pot and I had to drink it out of a tea cup. In Wamena on Papua there was no alcohol at all. The whole Baliem Valley is a dry area. Apparently the indigenous people had lots of problems with alcoholism, so the government decided to ban alcohol in the whole valley. Since the valley cannot be reached by road, such a prohibition works to some degree (although I did see a couple drunk natives). Indonesia was a great country to visit. I am especially interested in wildlife, so seeing the Great Apes and Komodo Dragons was especially important for me. On Java I enjoyed the old temple complexes. People are generally very friendly. I felt safe throughout the trip. I can recommend a visit. I have collected the pictures by island, plus pages for wildlife and people. has a collection of all my pictures of great apes from various countries. Here are the links to the pictures.